I remember having this previous years, but I haven't seen it mentioned yet: is it okay to have picture-in-picture shots for things like interiors/trapdoors/moving parts etc? tiberium_blue wrote: In the vig category, am I allowed to move some elements around in each photo so that the 3 photos tell a sort of mini-story? Can you tell a story with the 3 pictures? Not like a cartoon: just one scene, but with 'moving' figs? You can do this for the Crime and Punishment and Miscellaneous categories. So that looks like a no for vignettes. I'd still like an admin to confirm please. Jelmer wrote: Can I use the custom minifig for that entry as a minifig in another entry (misc)? You can use that minifigure as another minifigure in the miscellaneous category. In the vig category, am I allowed to move some elements around in each photo so that the 3 photos tell a sort of mini-story? Definitely no. Vigs are meant to capture a single moment in time. Also, most people have broadband these days, any chance on getting the 800x600 dimensions raised a bit? No. Your contest folder for grading must contain only the three 800x600 images. You may make another folder with larger images and link to that in a forum thread. This is only acceptable if it shows a moving action like a trap door. Categories such as the hideout could need this feature. Alan's "Lady of the Lake"
In each of these you can see the whole story, right there in one image. I've written more about vigs in what makes a good vignette? and a peek behind the curtain. Okay, I have a question for these admins. Can I print out a few words, and stick them to some bricks? I don't have a single one of these, ( http://www.bricklink.com/catalogItem.asp?P=3070bpb09 Any kind) and I NEED something like this for an entry. Thanks for replying to my previous questions. I did have another one though. 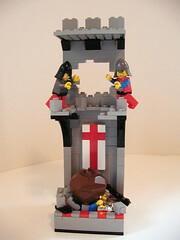 In the "chivalry" entry, I know that you only want one knight; otherwise the MOC would turn into a "battles" contest. Is it permissible to have more than one enemy, though? For instance (and this isn't neccessarily the idea that I had in mind), a lone knight holds the bridge against the advancing army, so the civilians can escape. Elephant Knight wrote: Okay, I have a question for these admins. Can I print out a few words, and stick them to some bricks? I don't have a single one of these, ( http://www.bricklink.com/catalogItem.asp?P=3070bpb09 Any kind) and I NEED something like this for an entry. Please pm me with more specifics regarding your entry. Is it permissible to have more than one enemy, though? Well, after thinking a bit, I found out that I will not need to print out anything, so false alarm I guess. I have another question. Is it allowed that the knight in the act of chivalary entry has a squire with him that stands on the side and watches? CastleLord wrote: I have another question. Is it allowed that the knight in the act of chivalary entry has a squire with him that stands on the side and watches? I forgot this would be going on! Hopefully this year I'll get to create a couple things to enter, I think last year I completely slacked off. There seems to me a nice couple categories that would only require a small amount of building so that's cool. Oh, and that master builder prize.. Dang! Somebody is gonna' be real happy when they win that thing! Thanks to everybody who put this together, and to all who donated prizes. I can't wait to see everyones' creations! For the Secret Hideout catagory, is the category restricted to Bulls, Forestman, and Wolfpack? Would you be able to use dwarves as they are usually secretive and isolationists? greenglo wrote: For the Secret Hideout catagory, is the category restricted to Bulls, Forestman, and Wolfpack? Would you be able to use dwarves as they are usually secretive and isolationists? I'm going to go out on a limb here, and guess that Ben's previous answer will work just as well for you. architect wrote: You can use any castle faction. Certain factions like the crown knights or crusaders likely would not need hideouts as they can overwhelm enemies with force and numbers. Dang, didn't see that one thanks Dan. Question: Should custom minifigures be put in the MOC's section with other entries or in the customs section? Just wondering, thanks in advance!